You can also easily track your time in 5pm using a desktop widget! 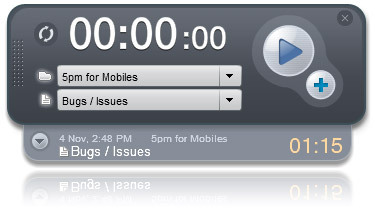 You may also consider TimeSheet third party time tracking app developed by Circado. Click on the badge above for download the widget installation file. This application requires Adobe® AIR™ to be installed for Mac OS or Windows. Time Tracker widget is FREE for all 5pm clients! ✨👍❤ Emojis in 5pm ❤👍✨! 8am contact management and calendar tool is now released! Import your data from CSV/Excel or MS Project files!